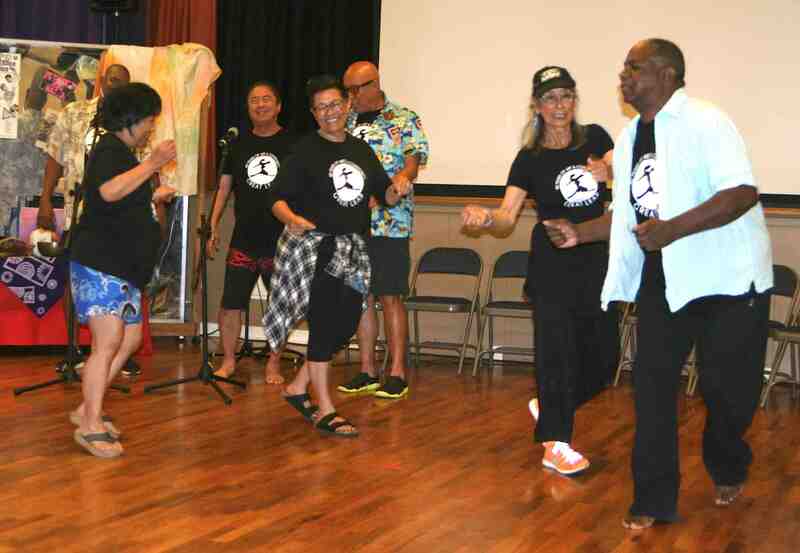 Great Leap held the second in a series of retrospective gatherings on July 8 at Senshin Buddhist Temple in Los Angeles. 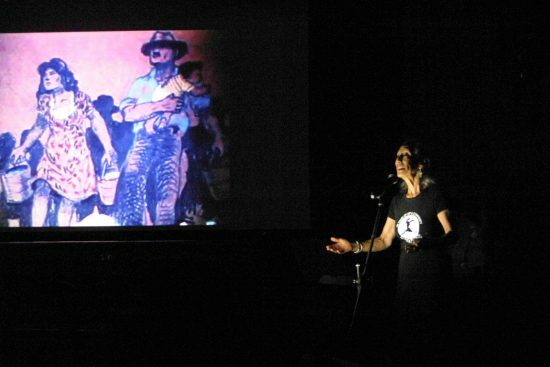 Great Leap was one of the earliest arts organizations born of the Asian American movement of the 1970s, finding voice through music, dance and theater. Senshin provided a sacred space within community to learn, collaborate, experiment and dream. Part 1, held in March, was “Finding Voice, 1970-1982.” Part 2 was “Our Stories on Stage, 1982-1996.” The series will continue next year. From the early ’80s through the early ’90s, Great Leap was affected and inspired by major national, local and community events: the Japanese American redress movement, the AIDS crisis, the L.A. Uprising and more. This led to the creation of an album (“Best of Both Worlds”), a short film, youth arts programs, two original ballets, two musicals, and a turning point in GL’s direction as a performing arts organization. Following words of welcome by ethnomusicologist and Great Leap archivist Dr. Deborah Wong, the program started with videos of two performance pieces: “Journey” (1985), about the immigrant experience in America, and “Bridge” (1986), about U.S.-Japan relations. Nobuko Miyamoto sang “Gaman” while a 1984 film illustrating her song was shown. Also shown was the short film “Gaman” (1984), featuring a song written by Great Leap Artistic Director Nobuko Miyamoto and arranged by Derek Nakamoto. It was an artistic response to the Japanese American camp experience. Miyamoto performed that song live, along with “Grain of Sand” and “The Chasm,” with Nakamoto on keyboard and Taiji Miyagawa on bass. Excerpts from “Talk Story I and II” (1987-89) were performed live: “English Lesson” by Young-Ae Park with Michael Paul Chan and “22nd Street Beach” by Miyamoto, Chan, Daryl Copeland, Mike Hagiwara, Deb Nishimura, Janet Saito and Deanar Young. 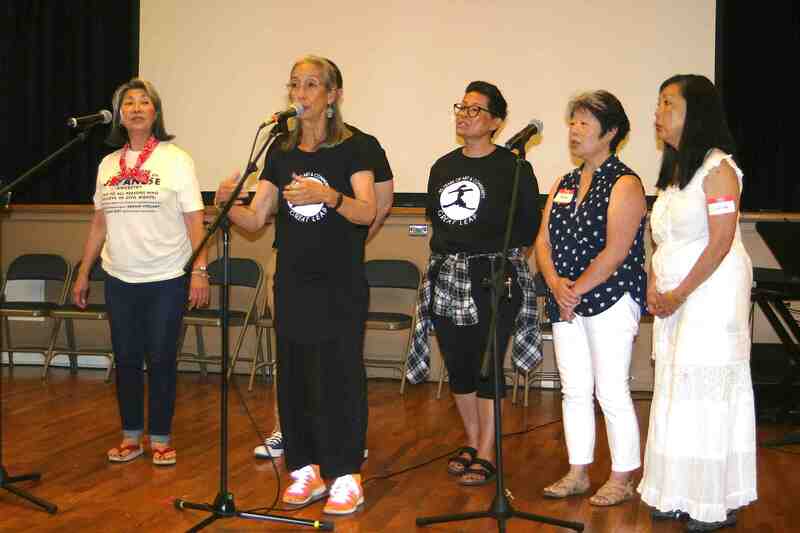 The musicals were a series of stories reflecting various aspects of Asian American life, with such characters as a Korean storekeeper, two Nisei women reuniting after the war, and an elderly Filipino migrant worker. Amy Hill and Dan Kwong, both known for their solo shows, did a mock interview. There was a tribute to Jose De Vega, a beloved performer/choreographer for many Great Leap productions, who died of AIDS in 1990, including excerpts from “Monologue of a Manong” and “Pilipino Tango.” Other Great Leap associates recognized in memoriam were Glenn Horiuchi, Raymond Johnson, Lynn Manning and Long Nguyen. The second half of the program included video excerpts from “Joanne Is My Middle Name” (1990), which refers to the fact that Miyamoto performed in Hollywood as Joanne Miya, and “A Slice of Rice” (1989-97), part of the Music Center on Tour in-school program, which later evolved into the multicultural “A Slice of Rice, Frijoles and Greens.” An excerpt from the latter show, “Nahuatl, Now What?,” was performed by Paulina Sahagun. 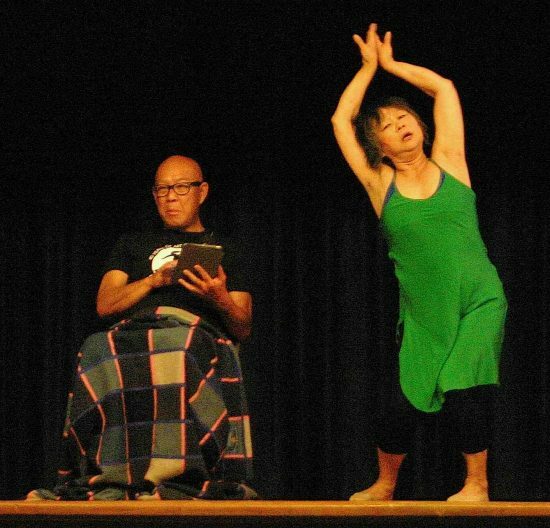 Amy Hill performed an excerpt from her one-woman show “Tokyo Bound” and Dan Kwong, Great Leap associate artistic director, did a segment of his solo show “Station Wagons of Life.” The two — who have explored their bicultural experiences in their stage works — also did a skit together. The program closed with a performance of “We Are the Children” — composed by Miyamoto and the late Chris Iijima in 1970 — in solidarity with the children being held in camps today due to the Trump Administration’s immigration policies. The singers were Miyamoto, Nishimura, Anne Ito, Nancy Sekizawa, Genie Nakano and Quincy Surasmith. Other performers and participants in talk-backs after each segment included Bob Miyamoto, Kathy Masaoka, Miya Iwataki, Leonard Hoshijo, Anne Etue and Great Leap Board President Meryl Marshall-Daniels. There were also video responses from Calvin Jung, Louise Mita, Arlene Malinowski, Chic Streetman and Shishir Kurup. Gathering 2 was coordinated by Miyamoto, Kwong, Wong, Eugene Ahn and Donna Ebata. For more information on Great Leap’s activities, including “FandangObon” on Oct. 7 at the Japanese American Cultural and Community Center, visit www.greatleap.org or http://archive.greatleap.org.